Broad Marsh 111B is a luxury bayside townhouse. This four-bedroom, three and a half-bathroom townhome has a furnished balcony overlooking a peaceful, family-friendly neighborhood and the beautiful canal. This unit is the perfect place for you and your family to call home for a week! 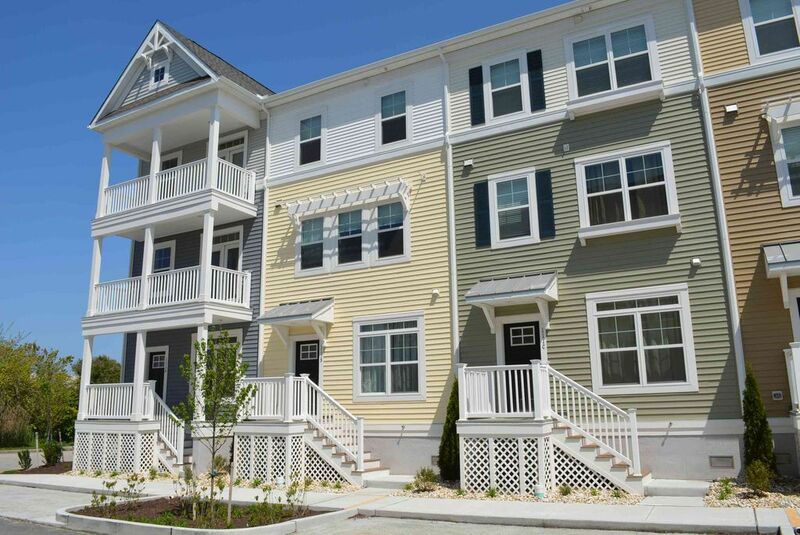 Broad Marsh 111B is one of Ocean City's most popular vacation rentals. The homey living room is furnished with a cornered, suede couch, a red leather arm chair, a small bench, and a television. The couch doubles as a queen-size sleep sofa. The sliding balcony doors allow plenty of natural light to brighten the space. Bridging the gap between the living room and the dining area is the fully-stocked kitchen with a wide, granite counter top, just right for grabbing a quick bite. The dining area is located in an alcove, providing a cozy environment for family meals. Also off the kitchen is a half-bathroom. Upstairs, you'll find most of the bedrooms. The master bedroom has a king-size bed, a personal television, a walk-in closet, a private bathroom, and access to the balcony. The second bedroom has two twin beds and a personal television. The third bedroom has a queen-size bed and a personal television. The second full bathroom is located in the third-floor hallway. On the bottom floor, you'll find the final bedroom and bathroom. The fourth bedroom has a queen-size bed, a personal television, and a private bathroom. This property comfortably sleeps up to ten people, so bring the whole family! Unit 111B has the following amenities: central air conditioning, outdoor pool, three parking spaces, garage, four TVs, four DVD players, four BluRay players, free WiFi, cable TV, HBO Channels, heat, full-size washer and dryer, refrigerator, ice maker, microwave, coffee maker, toaster, stove, disposal, dishwasher, and an outdoor foot shower. This property is non-smoking and does not allow pets. No group rentals for guests under 25 permitted. It does not include linens. Come stay at Broad Marsh and create wonderful memories to last you and your family a lifetime! Amazing house & great rental experience! So happy to hear you enjoyed your stay! We would love to see you back anytime! Beautiful House Close to Beach, Restaurants and Bars! This house is absolutely beautiful! I came to OC with some friends for a weekend getaway, and this place comfortably slept all of us (plenty of bedrooms and more than enough bathrooms). It looks like this house was taken right out of a magazine. Everything is brand new, and layout is open and airy. We were only a short walk from the beach, restaurants, bars and shops, and there is also a neighborhood pool for visitors to enjoy. I will definitely stay here again. We are so happy you had a great time in Ocean City! We would love to see you back anytime!